The chef at one of my previous places of employment couldn't properly pronounce "caprese" if his life depended on it. Fortunately, that didn't stop him from having the best knack for perfectly combining flavors of anyone I've ever met. Enough about him, let's talk about me! I've been on what can only be described as a caprese rampage over the past month or so. The trigger for this obsession was my first taste of fresh basil from our garden. I've been looking hard for places to use it, and it often ends up combined with tomatoes or mozzarella, and usually both. Those people of Capri really knew what they were doing when they joined those three ingredients. My brother and sister-in-law recently gave us 3 dozen eggs from their chickens, so frittatas, quiches, and egg-focused breakfasts (and breakfasts for dinner) have been staples of late. For this frittata, I made use of that wonderful and addictive caprese blend and added sliced cherry tomatoes, fresh basil, and grated mozzarella. The flavors were great, though the structure of the egg pie was, shall we say, weak. I didn't think about it at the time, but a drizzle of balsamic reduction would've been an awesome finishing touch. Heat an 8-inch ovenproof, nonstick skillet (cast-iron is great!) over medium heat. Add the olive oil and tomatoes. Season the tomatoes with 1/4 teaspoon salt and cook until they are soft and beginning to fall apart, about 4 minutes. Meanwhile, whisk the eggs in a large bowl. Add the milk, basil, remaining 1/4 teaspoon salt, and pepper and whisk together until light. Pour the egg mixture over the tomatoes, sprinkle with the mozzarella, and bake for 45-60 minutes, until browned and just a little bit jiggly. Cool 10 minutes before slicing. Caprese is a perfect summertime flavor combination. I purchased two heirloom tomatoes at the farmer's market last weekend and they will be on my table tonight in the form of a caprese salad! Love how you have introduced the combo to a frittata. Good work! 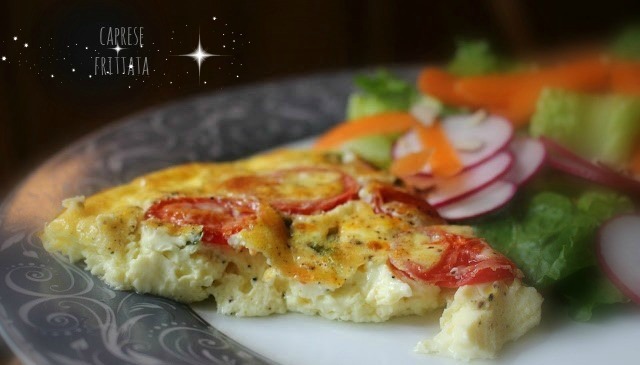 Perfect dish for breakfast, lunch or dinner! Simple and delicious! Mozzarella is easier than you anticipate! I love caprese. And margarita pizzas. Perfect combinations! I could eat caprese combinations every day of tomato season! Love the thought of this mixture in a frittata. And, I'd love to make mozzarella some day. Can't wait to hear how it goes. OMG. Looks so scrumptious! I totally love mozzarella and tomatoes... lovely recipe! thanks for sharing! Totally love caprese... any time of any day. However, can't see me making my own mozzarella any time soon! LOL. Ooh what a great idea now that you've got lovely summer tomatoes. We're in Winter in Australia although I'm in Thailand and first thing I ate had tomatoes in it and I realised how much I missed them! This sounds delicious - and I can't wait to see the results of your challenge! I am crazy for caprese too. 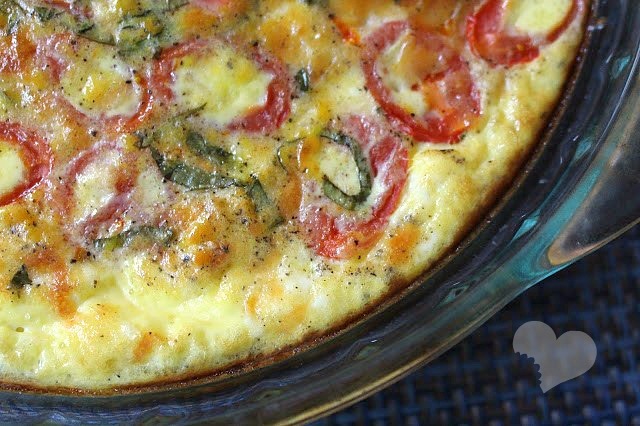 This frittata looks AMAZING! Yum. Yum, those definitely are the flavors of summer, can't wait to hear about making mozzarella at home. I recently got to make butter, which is another kitchen staple that is really easy to make. I can't wait till our tomatoes are ready to eat! The cherry tomatoes are beautiful sliced in this. Great idea!